It was the main factor for Q-OILS CZ s.r.o. company (Nemčič, Czech Republic) while choosing equipment for 10 liters PET bottles production. Q-OILS CZ s.r.o. has been packing vegetable oil in the Czech Republic for 20 years. Along with other plastic tanks and cisterns, PET packaging is also used. The product range of the company includes rapeseed, sunflower and palm oil. One of the partners of Q-OILS CZ s.r.o. is the AVENA s.r.o. company (Bzenec, Czech Republic), that specializes in PET packaging for vegetable oil. Having faced the choice of purchasing their own blow molding equipment, the company has decided for automatic blow molding machine APF-5 manufactured by PET Technologies to produce PET bottles of 3-10 l volume with 1500 bph output. 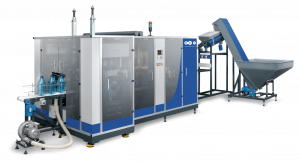 In 2018 we delivered blow molder to Czech Republic thus opening the market of another European country. The main task of PET Technologies is the implementation of the client’s ideas in PET packaging. We are glad that once again we managed new success project and acquired new partners such as Q-OILS CZ s.r.o. and AVENA s.r.o.